Appliance removal can really be a hectic job sometimes, especially when you’re busy. Old appliances are mostly heavy and difficult to lift, which is why we’re here to help you without Appliance removal services. Old appliances not only look bad, they are also noise, space-consuming, and inefficient. Many of the old washing machines, refrigerators, air conditioners harbor mold and also pose a problem with wiring past their prime. Such situations can be threatening to both your health and safety. Sometimes, you may get tempted to pull out your air conditioner, remove your old stove or fridge from your kitchen, or trying to carry out your washing machine up from the basement. Please don’t do such dangerous tasks by yourself and let us do the all the risky work for you. 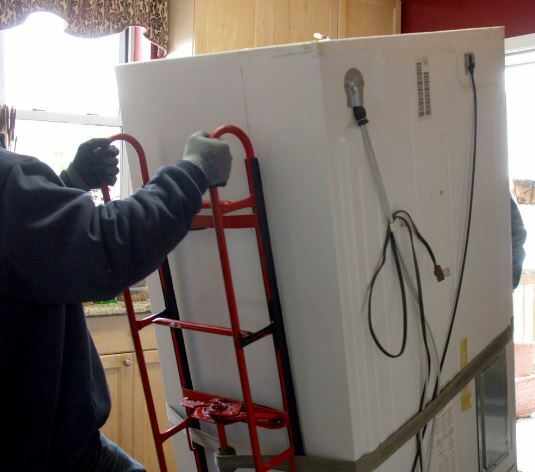 Do you know that a standard fifteen year old refrigerator weighs around 250 pounds a piece? Most people are not strong enough to lift such weight and even if they are, it’s highly dangerous to do such things unless they are an expert. The best way to get your old appliances removed from your house is to contact Mesa Junk Removal. We have a dedicated team of committed professional who are working around the clock to ensure our clients’ appliance removal programs are carried out without any hassles. No matter what the appliances are, our team is fully capable of providing all services related to appliance removal. Our team is fast, efficient, and professional. All our services come with a very reasonable price tag, as we are highly focused on providing affordable services to our clients. As soon as you contact us regarding your appliance removal, we make sure that our team gets the job done as soon as possible without any delays. Give us a call and let us handle the difficult work for you.